Day 53 – Stephanie E.
I had the great honor to meet 9 1/2 years old Stephanie E. at Indigo Moon, a yoga/massage and gift shop where her mom works. Stephanie is great not just because she shares a great name as me, but she is truly an all around amazing kid. As a fourth gra der, she is a Safety Patrol Monitor at her school. Her role is to help as a hallway monitor and bus buddy. Stephanie is also involved in The Circle of Giving program at her school that was created to honor a teacher’s son who passed away in the third grade. Stephanie believes the program has been going on since the 90’s. 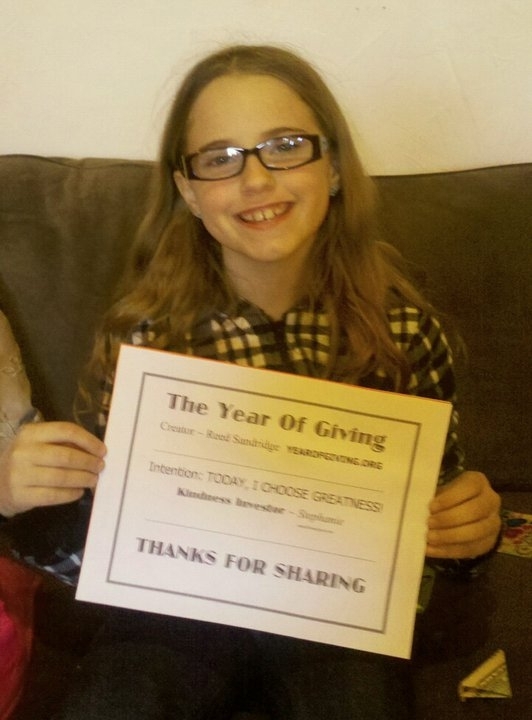 She thinks it’s a great opportunity because over Thanksgiving she volunteered at The Ronald McDonald House. Stephanie has also decided to give back by volunteering to help the Food Bank of New Jersey feed people, especially children. She decided to volunteer with her mom. I asked Stephanie, “Why is your mom great?” Stephanie said her mom is funny and makes her laugh. She says being funny helps people to be happy. This young girl is not only giving in many ways, but also talented. She is a great artist, an excellent writer and loves gymnastics, even though she is now healing from a sprained ankle. Stephanie also likes swimming in the summer and always loves playing with her dog, Brodie. This young lady describes herself as, “crazy in my own way.” I asked her what that meant. She said she likes to entertain people and is usually energetic and happy. Stephanie said the greatest gift you can share each day is happiness. I have to say, I agree! Kids are great and so are you, Stephanie. I love the creative person you are. You are a leader and will continue to do great things in your life! What is she going to do with her $10? Oh sorry 🙂 Stephanie bought school supplies with the $10. Good Job Stephanie! This is an awesome accomplishment! We’re all so proud of you!